A new report from the Rudd Center for Food Policy and Obesity, a non-profit research and public policy organization, found that many popular fruit drinks marketed to children can have the same, if not more sugar as a candy bar, and many use artificial sweeteners. Dr. Marlene Schwartz, deputy director of the Rudd Center for Food Policy and Obesity, said, "The companies really are misleading both the parents and their children. (These drinks are) essentially water and sugar and artificial sweeteners ... and they're trying to package them to look like they are juice." 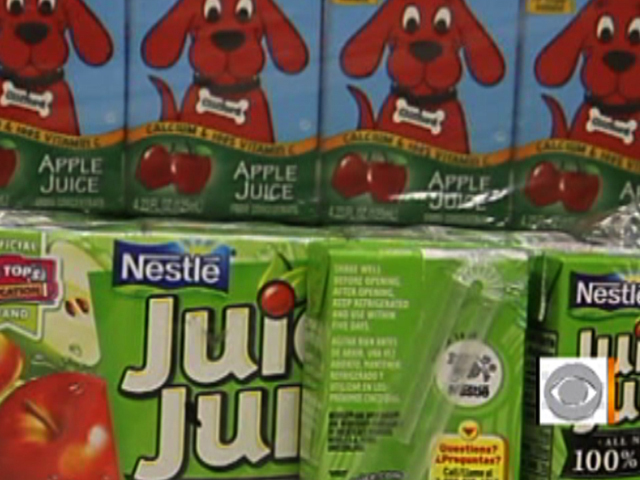 The report also found companies specifically target young kids in advertisements to sell their products. In a statement, the American Beverage Association called the report "another attack by known critics in an ongoing attempt to single out one product as the cause of obesity," adding that soft drink advertising has dropped by 96 percent since 2004 during children's programming. But the industry is still self regulated -- something Schwartz says she believes must change. Schwartz said, "I don't believe self-regulation is the answer, I think in some ways government regulation would be easier because it would guarantee a level playing field." Nutritionist Keri Glassman, author of "The O2 Diet," said on average fruit drinks, soda and caffeinated energy drinks have seven teaspoons of sugar in an eight-ounce serving -- the equivalent of about 10 Hershey Kisses. "When we have something like a Hershey kiss, we know we are having a treat," Glassman said. "One of these sugary drinks, an eight-ounce serving a day can increase a child's obesity by 60 percent." Glassman added the American Heart Association recommends no more than 15 grams of added sugar a day. As far as fruit drinks go, 100 percent real juice is recommended if you are going to have juice. For infants, no juice is recommended and for 1- to 6-year-olds, only four-to-six ounces of real juice is recommended per day, and for older children, ages 7 and up, eight to 12 ounces is recommended a day. Glassman added, "Kids are drinking two, three, four times this amount. And 15 grams of added sugar adds up fast. Two thirds of these sugary drinks have at least that amount in one serving, and then there's also added sugar in things like cereal and breads and crackers." What doesn't help, Glassman added, is that the labels can be confusing, "especially when the fruit drinks say 'natural' and 'contains Vitamin C.' You want to make sure it's 100 percent juice, if you're going to drink juice. And water is the best choice for hydration, and you also want to avoid added sugars, artificial sweeteners and artificial flavorings."